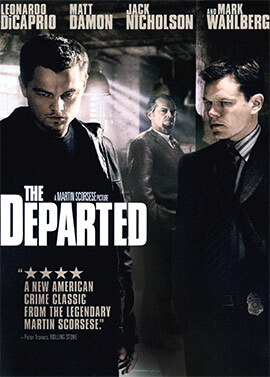 The Departed was released in 2006 with an all-star cast that for many, marked Scorsese’s return to his crime roots. Though it is in fact a remake of the 2002 film Infernal Affairs, The Departed has Scorsese’s signature depth and gravity in spades and tells the tale in a distinctly American way. 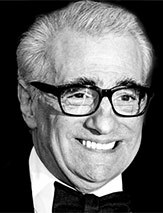 Mirroring his gangster movies of the past, Scorsese draws from the grass roots for this Boston based movie, looking at the ties that bind; family, community, loyalty and duty. Identity is explored and twisted as the characters battle to unmask each other in a game of cat and mouse. The Departed is fuelled by a truly excellent cast, each lead giving a great performance but also working marvellously in concert with each other. Billy Costigan, played by Leonardo DiCaprio, is a cop who goes undercover. Colin Sullivan, played by Matt Damon, is a criminal who infiltrates the police as a recruit. We have two warring factions, both with spies in their midst, playing out almost like a ballet. Reigning over the gang we have Frank Costello, played by Jack Nicholson, whose performance truly captures all attention and is perfectly pitched to show how his character commands loyalty. His opposite number is police captain Queenan, played by Martin Sheen, who takes more of a back seat but vitally underpins the character of Billy. Identity is a central theme in The Departed, as Billy and Colin must undergo the usual trials of undercover work; staying true to themselves while maintaining their masks. They must find out where the line is and what they can get away with, always fraught with potential disaster. Billy is forced to commit crimes and Colin must arrest people he considers friends. This becomes all the more fraught as both organisations know they have a cuckoo in the nest; so each man is also looking for his counterpart. The movie gains an incredible tension, especially as events accelerate towards the end. The addition of psychologist Madolyn, played by Vera Farmiga, adds a new layer as she knows both men. This makes their entanglement not just professional, but personal. The cloak and dagger aspects of this tale, made almost espionage-like with the modern setting complete with computers and phones, are a machine through which the actors are thoroughly wrung. DiCaprio excels as always, delivering a troubled character who we feel for, while Damon feels like a dead man walking, a man doomed from the start, but not as easy to sympathise with as that suggests. Their performances are very impressive, especially when you consider that a core component of an undercover story is that they must act their covers; they’re not just playing a character, they’re playing a character who is also playing a character. With overtones of Irish American Catholic culture, of which guilt plays no small part, this is another Scorsese movie which draws on his authentic childhood insights. Featuring an opening that shows our protagonists as children, there are parallels to GoodFellas in this movie, but it leans more towards sympathising with the police than the gangs. Scorsese again delivers a movie where violence is key, but realistic in its sudden use; it is unpredictable, fast and dangerous. This is a movie where anything can go wrong at any time; a tense, mesmerising drama.